I’ve never played high stakes poker or bought in at a casino, though I do like to have friends over to play poker on occasion. It’s cheaper than going to a movie and much more interactive and relational. And I just like it. I like the interplay of the game. I like trying to read other people’s minds, while hoping they can’t read mine. I also like that whoever loses (Which usually includes me) hasn’t really lost anything. It’s an exchange of a few bucks for a night of good fellowship, while the winner gets to gloat a bit among friends. But even in our low-stakes games, the $5 we each put in gives the chips meaning. 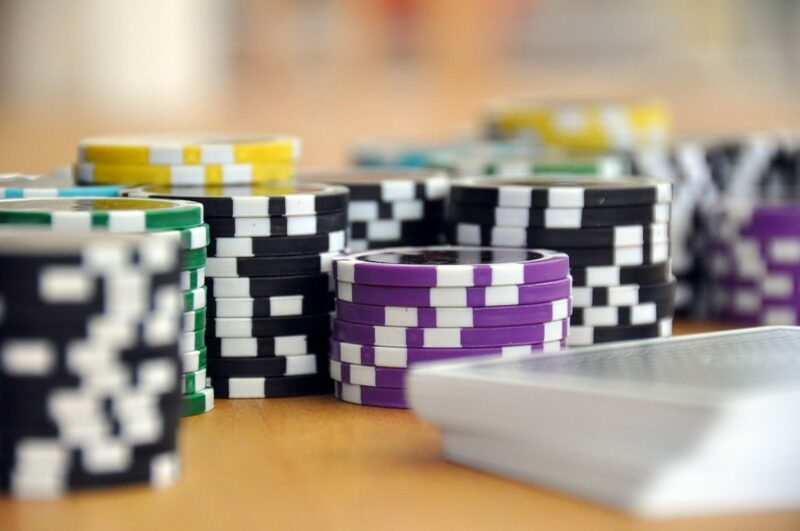 Someone will occasionally joke about how they just lost 10 cents on a hand, but all in all, there is a simulated feeling of real loss and real gain when someone rakes in a pile of chips at the end of each round. I hosted a poker game on my birthday a few years ago. My friends paid for my $5 buy in. This was an interesting psychological experience. When I would lose a hand, I would simply say, “House money, baby!” And when I won a hand, I would feel like I had really won something, because I had. But playing with house money took the sting out of my losses. I didn’t actually have anything riding on the game. A loss wasn’t actually a loss. It was a refreshing and freeing feeling to play the game only being able to win. We go through most of our Christian lives trying to win the big pot in the middle. And if we do win the big pot, the cycle of needing to win just continues. We won the hand, but now we must win the game, the game that never really ends. This is reflected in the way we pray and in the things we think we are to expect from God. And man, does it produce a lot of disappointment and anxiety. We go to God like it’s his job to give us our “Best Life Now.” Basically to answer all of our prayers and give us the life we want. But when we don’t get thing we are praying for, how do we feel? We feel like we just pushed all of our chips into the middle of the table and lost the hand. And now we’re broke. When I feel this way about something I’m praying for (and not getting), God shows me how I’ve made this my “Best Thing.” The “Best Thing” being what I think will give me peace and joy, satisfaction and contentment, which is why I feel such a disappointing void when it’s not there. These are the things Jesus promises to give me from himself, not from a gift he bestows on me. In many respects, when I approach him like this, he becomes Santa Claus. I don’t care about him, I care about what he can give me. And it shows in the way I react if I don’t get what I want. If Jesus were my Best Thing, why would I be so downcast because I lost the poker hand? It’s not wrong to pray for things or bring our requests and petitions to God (Philippians 4:6-7), it’s wrong when these things become idols. When they become the thing we think will give us joy, peace, satisfaction, and contentment. As if we didn’t already have these things in Jesus. As if we weren’t already playing with house money. Husband Jesus, please give me a different husband to make me feel whole, content, and valuable. Amen. How’s that one going to go over? Exactly. Yet that’s how we pray over and over and over again. But when Jesus is our Best Thing, it’s like playing with house money. We can’t lose! We have already found our peace, joy, and wholeness in Jesus, so when we bring our requests to him, there’s no way we are hoping to get these things out of these requests. It’d be like asking for a husband when you already have one! They key is to realizing that we are playing with house money. We are sitting on the biggest pile of cash imaginable. We hold the credit card to the owner of the entire casino. And it’s time to enjoy! By “enjoy,” I don’t mean get everything you want, your “best life now.” I mean enjoy Jesus! Enjoy what you already have in him. Learn to take the intimacy of your relationship with him deeper and deeper. He’s inviting you. The Psalmist has found The Best Thing, and he’d rather have it than anything else. Do you and I feel the same way about Jesus? You’ll know the answer to this based on how you feel when you pray for something that He doesn’t give you. This is something we are all going to fall short of time and time again. Don’t allow the realization of this truth to spiral you into shame for not being a good enough Christian, hear it as the invitation it is from Jesus. Let him be your Best Thing. Savor the truth that you God’s son or daughter. Spend relational time with Jesus today. Hey, haven’t listened to the message but great post. Flip side of the same thing is it’s freeing believing we are crucified with Christ and the life we now have is His. The reality is freeing. For too long I tried to lay hold of life in Jesus without laying hold of the truth that who we are apart from him is dead in Christ. It’s just really frustrating and tiring to live both. Sometimes you let go and you find that you already have what you’re looking for in Him. An FYI, I’m figuring you know about the story of Asia Bibi in Pakistan. She was ruled innocent of blasphemy by the Supreme Court last October. Tomorrow, the 29th, an appeal of that decision is being heard by the SC. Remember her in your prayers and spread the word. Word came down in the last hour. Supreme Court upheld its acquittal of Asia Bibi. Her legal journey is finally over. She has survived almost 10 years of unjust suffering. She is free. How good is that! Praise God for steadfast love!